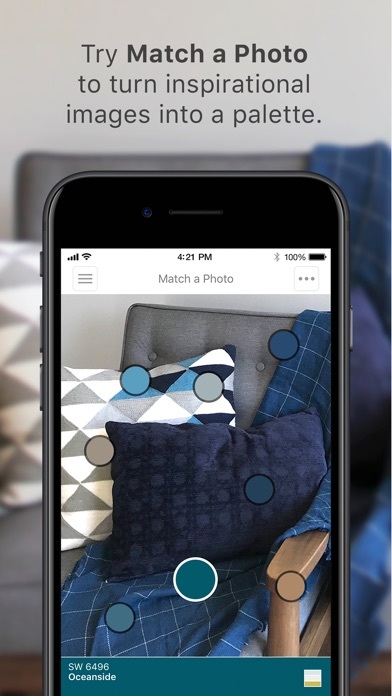 Instantly “try on” any Sherwin-Williams color on your own walls, in real time. 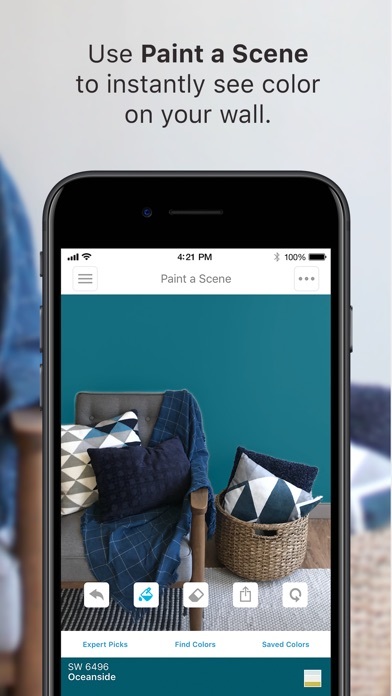 With ColorSnap Visualizer’s new Paint a Scene feature, you can use augmented reality or a photo of your space, tapping the wall to change its color instantly. Of course, you can still capture color inspiration on the go, match a photo and use Rotate to Locate to easily find any color inside our stores. 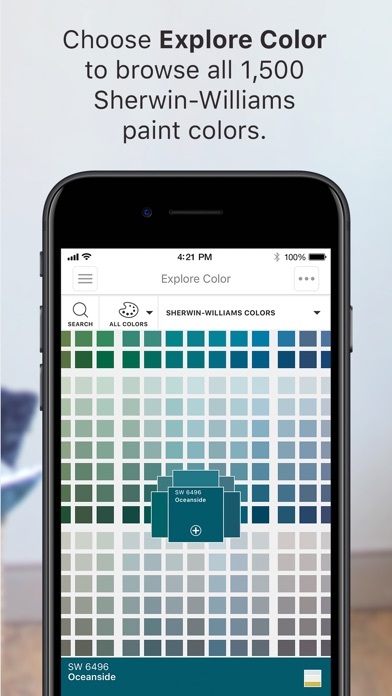 Get ready to make faster, more confident color decisions with ColorSnap—only from Sherwin-Williams. 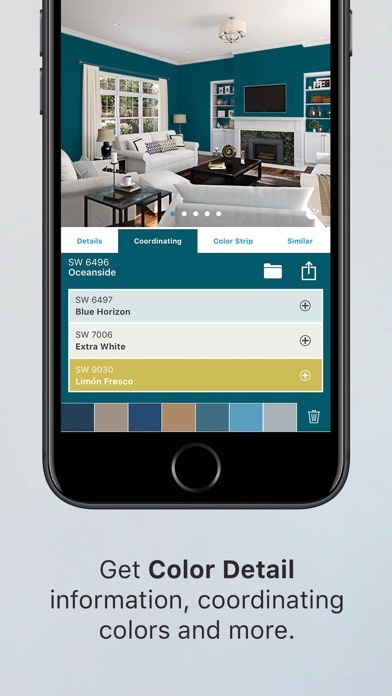 I am SO HAPPY Sherwin Williams made this app! I have had other color match apps before, but they only gave color values, not existing paint chips. Matching to paint chips is much more useful. The ONLY complaint I have is that you can’t organize your saved color palettes. They just go into chronological order, based on the most recent one you changed. If the user could even make folders it would be helpful. Other than that, AWESOME! I am unable to use some parts of this, get a message saying I need a 6s or more and 11.1 or more...well I am using a 6s and running 12.2 so what gives? For a first time user it was very difficult. There is no area in the app that explains what to do. 1st I am painting the exterior of my home, so when I try to see the exterior stain samples by entering the name and number of the stain it says that there is no color found. I am very disappointed. This app doesn’t work for busy photos. I have kitchen windows and curtains hanging and it doesn’t work. I really wish I could just hand paint the area instead of selecting a space for it to recognize. If your walls are all white, you’ll get everything painted, including ceiling. I have an iPhone XR and this app doesn’t work at all. It either covers the whole photo with a filter-like translucent version of the color you pick, or it creates a weird pixelated patch at a random spot in the photo. Saw this in a commercial? Forget it...this app doesn’t do anything like what you saw there. The app is no where near accurate to color options. In fine print is says to always go to the store and make sure. It needs to be in Big Bold print!!! Do not go off of this app alone. This app works just ok. It doesn’t let you pick a section and paint it a different color. It changed the whole thing to the new color, which is great if you’re trying to just paint an entire wall with no obstacles. I received my ColorSNAP match device during an event where a Sherwin Williams rep gave me and a colleague a demonstration. After getting home and attempting to synchronize the devise to the app has been frustrating. The app itself is great and I know I will use it frequently, but the little device is useless if I can’t connect it to the app. All I can say is that it is difficult to accomplish anything with it. And stupid design flaws. They put little thought into the app and it shows. Couldn’t figure out how to isolate the portion in the uploaded photo of my house that I wanted it to show the paint color. It turned the whole photo the paint color which isn’t really helpful. The colors show up like a filter would on a photo so it won’t show you what the color would look like unless your wall is white. It also doesn’t allow you to view more than one color at a time. I didn’t have a problem with navigating or taking a picture of my own home; all the advertised features worked. The app quality is poor. Just get a fan deck to pick out colors. One would think you would be able to highlight trim, ceiling and walls. But no, this is not possible with this very limited app. 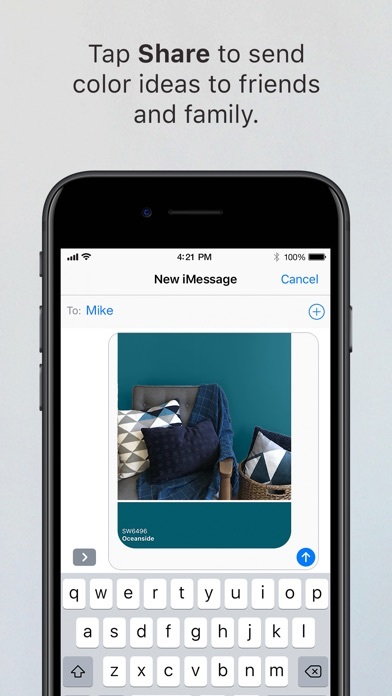 It can paint whatever you tap on, but you cannot place different colors on walls or trim, apparently SWP believes people want a single color look for their rooms. What are SWP executives thinking when they allowed this garbage app to be released? Just damages their brand further. Might work on iPhone, but worthless on iPad. Can’t log in, screen is tiny, etc. When you upload a photo and choose a paint color the colors and effects and not realistic at all. Looks like something from paintbrush on an old windows computer. I downloaded this thanks to an instagram ad. In the ad, the visualizer paints flawless walls to exact swatch colors. The real app has an extremely difficult time detecting edges, which wouldn’t bother me in the least if the rest of it worked. When you choose a paint swatch and “visualize” your room, the color in the photo is miles away from the swatch - made glaringly obvious because the swatch and the painted wall are literally side by side. Not worth your time if you actually want to visualize a real color on your wall. It’s wildly inaccurate. This app is not helpful at all. I have wasted time and to top it off gave this company all of my personal information (duh right?) for what? Nothing. Upload a picture of your own and pick out the colors you want, then you can “paint” it to see if the colors go with each other. If yellow was picked for the walls it painted the whole room yellow. If white was picked for a door the whole room was white. :p Don’t bother. Just trust your instincts and use the colors YOU like! I wanted to match a paint to my window treatment I snapped several photos of the curtain. Each time the app gave me different paint colors to use. None of which matched my curtain. Also, I snapped pics of my wall. The resulting pic took the blue out and gave me paints that didn’t match at all. I could not even use it to get something close. Very confusing and hard to manipulate where colors will go on the outside of the house. Don’t like it! Has a lot of great features, and useful for exploring base colors. I’d say useful, not the whole decision process. But I really wish I could coordinate multiple colors in the simulated rooms. I am not sure how to work this app but after reading a review about learn how to use it, I am going to load it again and try their suggestions. For now I give it a one star. Unless you’re painting over something white. Any other color will bleed through and there is no way to tell what the color will look like. I deleted a duplicate color palette, but the app deleted both versions. And doesn’t have an “undo” option. Also, “App Support” doesn’t provide app support; it’s the generic corporate website everything-but-app-support page. Makes me want to throw down my phone!!!! I really love that I can take a pic of anything and this app builds a color palette for me! It doesn’t work that well. Doesn’t give me a sense of confidence on color selection based on how poorly it “paints” the walls. It might be due to low lighting or shadows. I’m not really sure. But even with all lights on it sets a spotty wall. I really wish this worked better. But what can you do with a free app? The app is garbage. Basic functionality like searching by color name and by color code never works. Only the “scan color code” feature works for finding a specific color. Which is only useful only if you have the color chip card. C’mon guys! This is bare minimum stuff! Make your parents proud and do something properly. Tried using the camera in the app and uploading an existing photo from my camera roll - neither worked well. Color did not stay within lines in photo. Also tried indoor photos vs exterior house photos, no success in either. Downloaded & then deleted the app within 24hrs. I really like this app! People are too critical.. It gives you a great visual idea of what your room would look like with different colors. The app is difficult to maneuver, almost impossible to sample the actual color that you want to try an forces you to use a pre loaded picture! Horrible! This app is horrible. Don’t waste your time. This app is great. I was worried it wouldn’t work based on negative reviews. You have to learn how to use it. If you click on paint a scene, you have to choose a color either new or from your saved SW paint perks colors, then it will access your camera. It does at first, take you to a pre loaded scene, but go back to the camera live using the arrow at the top, then touch the screen and it will load it to your own live picture. It just takes a little exploring, but it does work. It may not be flawless but it’s the best I have used to get a color on your own actual wall to see what it will look like. I’m not sure the color it paints is very accurate. I wouldn’t choose a color based on this first. I would choose a color you really like, then put it in this app to get a “general” idea what it will look like. All electronic devices are going to vary in their pixels and look different. The chip is still going to be the most accurate. It has its uses, and its limitations! I appreciate this app’s good features. Be aware, however, that after you take a photo of your “well lit room” and you click on a color, to “see it on your walls” it will apply it to their stock photo. If the app could apply it to MY virtual walls, this would be far more interesting, helpful and fun. In my case the light neutral colors of woodwork and furniture of the stock photo are very similar to mine. So it’s not such a stretch to envision the wall colors in my setting. I can imagine that if your trim, ceiling and furniture are in a very different color palette it will be difficult to picture. They do indicate, in the very tiny print, that one should, as always, try a swatch of paint on your walls to be sure if it’s going to work. I’m also not sure of how accurate the colors are that the app tries to ‘match’, in order to suggest colors. To be fair I do know my camera photos are not a completely accurate match to what my eyes see, due to any camera’s limitations. Phone cam’s just aren’t as good (yet) as a human eye at discerning subtleties. So, given that, it does a pretty good job of suggesting colors, and you can see more suggestions as you click on each color. Would I use this to pick my colors and then buy the paint to match? Certainly not without getting a color swatch and paint sample, at the store, then painting it in the wall and viewing in all my lighting conditions to be sure. I would, however, use it to get some ideas before going to the store. Standing in front of all those samples, without any ideas, can be very overwhelming. . Colors are not accurate. I guess it matches to the closest Sherman Williams paint rather than a custom paint color. The matched paint colors were awful. It’s amazing this app has a national paint name associated with it. Waste of time even trying to get it to work. I can’t even imagine how much they paid to develop an app that doesn’t work. We will be buying a different brand paint. Thought this app would solve my waffling on colors problem. It’s very hit and miss. Not enough parameters to color the wall or side of the house. Paints the entire pic, and erasing where you DON’T want paint takes alllll the color away. Great concept but needs some serious tweaking. This app crashes every time. Everysingletime. 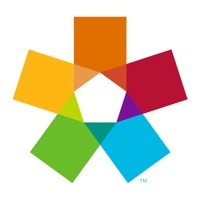 The title says Colorsnap for iPhone but other reviews are saying it only works for iPad. I am using a 7 plus and none of the features of the app work. Deleted it. If you have to use the taking a picture method, it’s exactly like the standard Paint program on old computers. Using a paint bucket to paint individual pixels and it doesn’t know the difference between shadows, anything hanging on your wall, furniture or the floor. Great concept for an app, horrible execution/delivery. I downloaded this app and found it to be horrible to use. In fact it was unusable. Don’t waste your time on this mess. Doesn’t really give you an idea of what the room would really look like if it were that color.